With a rainfall in parts of up to 2000mm and a reputation for some of the UK’s worst summer traffic, it’s somewhat curious that Paul and I decided Devon would be a good place to go for our first UK break. However, with beautiful sunny weather, glorious countryside, fantastic company and yes, a few gardens thrown in, even the ten and a half hour journey wasn’t enough to dampen our spirits. The truth is, I’d been ogling over pictures of the RHS Rosemoor garden for some years and having learnt of the holiday lets located within the garden itself, it was pretty high up on my places to visit. More on Rosemoor later. Our first stop was actually in Wiltshire – about half way between London and Rosemoor – where we had scones and proper, proper clotted cream at Stourhead. This National Trust medieval property, at the source of the River Stour, was purchased by Good Henry Hoare in 1717 for the princely sum of £14,000. ‘Good’, because the Hoare family included so many Henrys that adjectives such as ‘magnificent’, ‘naughty’ and of course ‘good’ are necessary clarifications. It was Magnificent Henry (I sadly failed to learn much about Naughty Henry) that started work on the garden in 1744, with his architect – yet another Henry – Henry Flitcroft. The Palladian panorama is very Capability Brown-esque, although Brown himself was working at Stowe House at the time and was in no way involved. By damming the river but keeping the natural valley shape an incredibly serene landscape has been created, with quite beautiful stone focal points adding another layer of beauty. It is one of those views where absolutely nothing jars; everything is in keeping. Heading on into Devon, I was very excited to make our way to the coast. Aside from a day trip to Brighton and a couple of flights over water, I hadn’t ‘seen the sea’ since our departure from Sydney way back in March. There is definitely something very special about coastal walking trails and the South West Coast Path blew all the cobwebs away and filled our lungs with fresh sea air. There were such very English views with patchwork fields and quaint wooden signs, yet we couldn’t help but make comparisons with Tasmania. Both places distinctly rural, full of patient, friendly people and stunning natural coastal scenery, but each with their own unique character. The next part of our trip was very special indeed. The lovely Jessica and Mike from rustyduck.net arrived at our apartment in Rosemoor and whisked us off through winding country lanes to their spectacular property nearby. I’d seen so much of this beautiful home and garden on Jessica’s blog and we’d swapped many messages but seeing it in real life was something else again. How wonderful the internet can be to connect like-minded people in this way. After a cup of tea we all went out to dinner at what must be one of the best foodie places in the county, to share more gardening (Jessica and I) and non-gardening (Paul and Mike) stories. …although there were a few hints that it wasn’t always like this. We walked amongst cows and ponies, sheep and goats, all farmed but sharing such large ‘commons’ as to appear wild. Paul remembered his decidedly muddy winter military training on these moors. And I reminded him how lucky he was to only have one person ordering him around these days, especially as he was generally only frogmarched through the very best world-class gardens, carefully timed to be at their seasonal best, no less. That evening, we were delighted to convince Jessica and Mike to leave their house renovations behind as we made the trip to the north Devon coastal village of Clovelly. With my close friend, Jo, having lived in Sydney’s Clovelly for many, many years, I was particularly intrigued to see Devon’s original version. Incredibly, England’s Clovelly is still entirely privately owned, having been associated with just three families since the 13th century. It has a notorious history of smuggling, was the home of the novelist, priest and university professor, Charles Kingsley, in the 1830s and was even painted by JMW Turner. Its fishing industry has now turned more towards tourism and with some 51 listed buildings, it is no surprise that it draws the crowds in. Looking back at the village from the harbour wall, the steepness of the rocky cleft is quite mind-blowing. Indeed the 120m drop from the top of the main street to the pier is too steep to allow wheeled traffic and sledge deliveries are used not as a tourist attraction but out of necessity. I was very glad I had left my heels at home (again!) as I carefully negotiated the steep cobbles. The next day, we sadly had to make our way back to London, but awaking to the sound of rain did make it that little bit easier. There’s so much more we’d have liked to have seen, but at least being just ten and a half hours away, we do stand some chance of making it back there again in the not too distant future. In the meantime, a very big thank you to Jessica and Mike for all the wonderful recommendations and for making our trip to Devon so very incredibly special. You’re right, the Hot Garden at Rosemoor is definitely hotting up! Time to get up there and have a proper look around. Glad you had a good weekend. Great to meet you both too. And you couldn’t have done better with the weather if you’d tried.. come back anytime!! We’re still dreaming of Devon! Thanks again and I hope you manage to get up to Rosemoor soon to see the Hot Garden; it must be about at its peak, I think. Hope the weather holds up for you again this weekend; it’s pure blue sky here. A wonderful short break indeed! It’s many years since I was in Clovelly. Such a fascinating place. I was thinking how smoothly civilised and gently undulating the English countryside looked compared to our craggy landscapes here in Australia – and then your photos of Dartmoor NP appeared. Wonderful. Looking forward to more revelations about Rosemoor. Your one photo is like a tantalising glimpse of a woman’s bright, frilly petticoat. Yes, there is definitely an Australian feel to Dartmoor, although perhaps less so in its more typical weather conditions. I think Rosemoor is probably my favourite RHS garden of the three I have seen (yet to get up to Harlow Carr); will post more when I get a moment. What a wonderful part of the world Janna. I too have always wanted to see Rosemoor (not too far away now I hope). I was intrigued by your 10 and a half hour journey! Devon being only 300ks from London or so. Or did that include stops along the way? I was just thinking here it takes about 3 hours to do that. I was also looking at the purplish/plum coloured leaves on the trees in the hot border – do you know what they are? I have planted several of Prunus cerifera ‘Oakville Crimson Spire’ (which I am sure these are not – colour the same though) and also 3 Acer ‘Crimson King’ which is a narrow maple and that does look a lot like those in the photo. Any ideas? I love that coloured foliage on trees. Thanks for this tour of Devon Janna and I must go now and check up on rustyduck’s web site!!! Sounds like a lovely garden too. Yes, the ten and a half hours did include stops, although the roads here are incredibly busier than most of Australia’s. You chance your life going on a road trip as a doubling of your anticipated time is not particularly out of the ordinary. It also wasn’t helped by Paul’s connecting flight in the US being delayed by storms and him missing his transatlantic flight home, involving an extra stop at Heathrow to pick him up and drive on directly from there. I didn’t see any labels on the burgundy trees in the Hot Garden but I’m pretty sure they would be beech: Fagus sylvatica ‘Dawyck Purple’. Jessica, if you know otherwise, please shout! Sounds like a wonderful trip, Janna, the weather looks to have been perfect too. 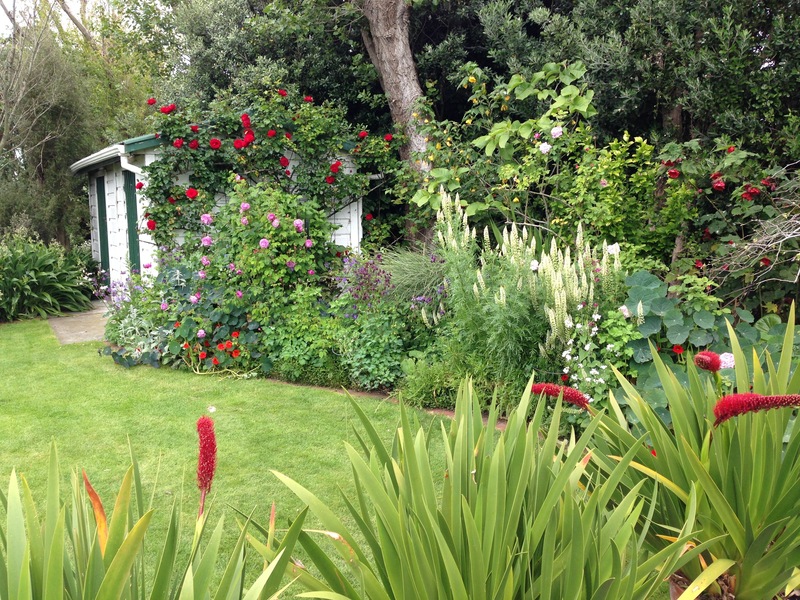 Lucky you visiting chez Rusty Duck, I’d love to see her garden …. I know, very lucky! At some point I very much hope to get over to you, too. I saw Lisa at Hampton Court Flower Show and she assured me it wasn’t as far as I thought, so we must book something in soon. Please do, it would be great to meet you – i think you’d enjoy the Lower Wye Valley, lots of great gardens and scenic walks. There is so much in this post I had to look at it a few times. 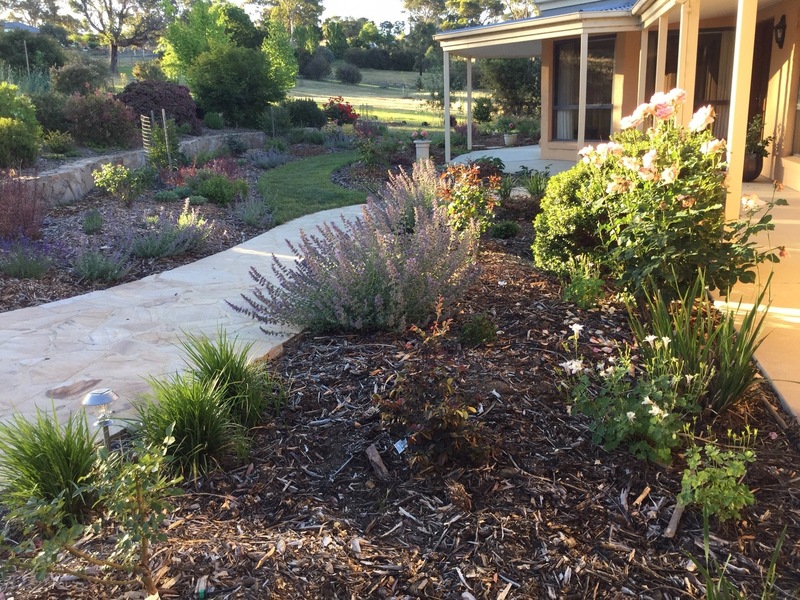 Lovely that you were able to catch up with Jessica & see the Rusty Duck cottage …. I don’t think I’ve seen the garden from that angle. I agree about blogging & the internet giving the chance to connect with like minded people.. such a pleasure. Also Stourhead … I love those gentle rolling hills & the expansive views & as you say … Very Capability Brown look. Dartmoor looks very wild & windy .. Thanks I enjoyed the tour. We certainly packed a lot into our few days down there, thanks to the tips from Jessica and Mike. Isn’t Stourhead just picture perfect? I’d love to go back again with a bit more time. Paul’s jet lag was kicking in having just landed at Heathrow about four hours earlier, so it was a bit of a whistle stop tour! All in all, I think we definitely need to head down to Devon again before too long. Sounds like all in all you had a lovely trip including meeting up with new friends. The scenery looks peaceful and inviting. My sort of trip! Yes agree that the Internet has brought about some like minded relationships – I found you! Spent all Saturday in my poor garden that has withered this cold winter. Underneath some of the dead matter, I can see the green shoots trying to push forth……looking forward to spring. It is lovely to see the colours of some of the bulbs and pure delight of the perfumes wafting through the air. Look forward to your next adventure or garden. It was so peaceful and inviting, Louise. So necessary for a country girl like me living in central London! So good for the spirit. It is funny how, when we have so much in common and lived only ten minutes from each other, it still took my website and your interest in gardening for us to ever meet. How lucky that we did! I always feel impatient for summer when I look at winter gardens, but in fact those first green shoots are probably some of the most uplifting sights you can ever see. It won’t be long now until your garden is in full bloom…and you’ll get to see what has self-seeded itself this year!